Along Jalan Tun Razak, direciton towards jalan Bukit Bintang, turn left into jalan u-thant after pass by Embassy of The United States of America, go further down, it is located on your right which is next to the Regal House. 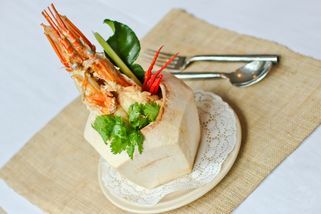 Rama V is the famous, award winning Thai fine dining restaurant that’s located in the heart of KL. It’s a little gem of greenery, water, and wood motifs in the middle of a concrete jungle. It’s like a slice of nature amidst the hustle and bustle of city life. 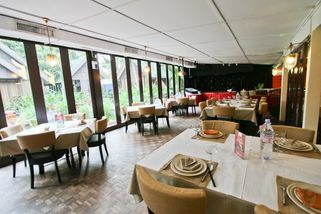 The restaurant itself is a standalone building with various small huts overlooking the pond that can be booked for functions such as parties or anniversary dinners. Indoors, the space is very spacious indeed—there’s enough room for big events and corporate dinners. 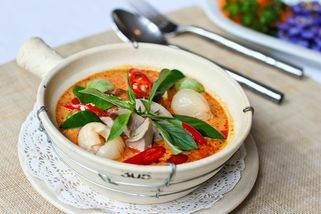 Rama V serves traditional authentic Thai cuisine, with a touch of quality wherever you look. 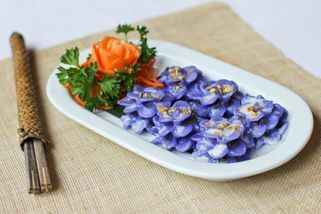 From famous favourites such as Tom Yum Kung to Chor Ladda (Flower Shaped Dumplings Stuffed with Minced Chicken and Peanuts), Yum Hua Plee (Banana Blossom and Minced Chicken Salad) and Yam Som O (Pomelo Salad with Minced Chicken and Shrimp), Rama V delivers them all to perfection. Visited Rama V on a Sunday night. Quite impressed with the decor especially the middle garden with the big pond. 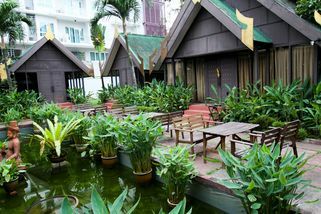 The little chalets take us all the way to Thailand without an air ticket. Beautiful. Although same could not be said about the offerings that night. 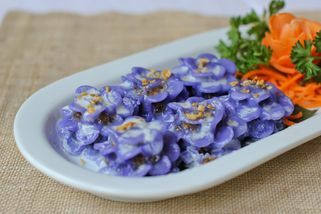 Only thing that really impressed was the Chor Ladda (Flower Shaped Dumplings Stuffed with Minced Chicken and Peanut) as you can see as the main photo here. A tango of sweet and savoury, a contrast of chewy and crunchy. Perfect execution. 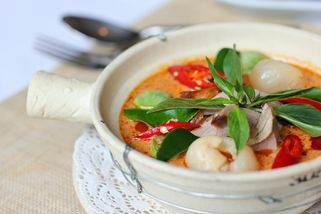 The rest of the dishes: Tom Yum Soup was nice with generous amount of seafood, but it was not spicy at all which was surprising. Pomelo salad with minced chicken and shrimp was refreshing on the palate, but again missing the spice. Pad thai was pretty ordinary, definitely had better elsewhere. The deep fried fish (name escaped my mind) was also quite forgettable, as there was little flesh and plenty of over-fried bits. Maybe it was just us as we heard plenty of positive reviews otherwise but I don't think we'll be returning anytime soon. Well, maybe just for the chor ladda.